What is it about small villages in the United Kingdom that make them so inviting and yet hating of outsiders? The picturesque beauty must obscure the “Locals Only” signs the hang off ever stare that greets you with a smile. Think back to The Wicker Man, American Werewolf In London or even Hammer’s The Plague of Zombies. The inviting charm covers up some diabolical secrets practiced by the merry locals. 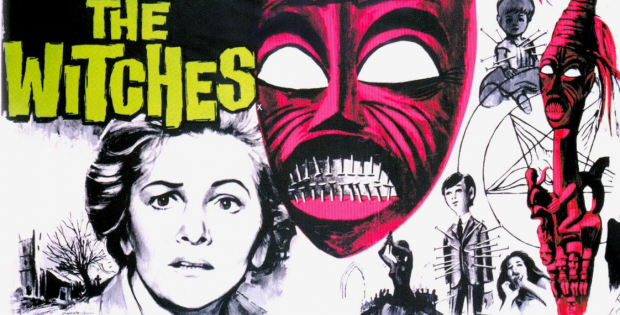 The Witches, a Hammer studio film from 1966 that was released in America in 1967 as The Devil’s Own. The movie has paranoia and witchery ooze from the rustic locales. Things didn’t end well for teacher Gwen Mayfield (Rebecca‘s Joan Fontaine) when she was running a school in deepest Africa. Turn out the locals rushed her out of town in a way that ultimately led to a nervous breakdown. She returned to England to recover. Reverend Alan Bax (i>Frenzy‘s Alec McCowen) hires her to be the headmistress of a small school at his remote village. She arrives in town to learn a few unusual things. The school is one room which isn’t that big of a shock to her. But then she learns the local church is in ruins. There’s also the fact that the Rev. Alan is self-appointed. There’s a bit of deception in the area. The locals get upset when Ronnie Dowsett (Village of the Damned‘s Martin Stephens) and Linda Rigg (The Last Tycoon‘s Ingrid Boulting) start being sweet on each other. Gwen doesn’t see anything wrong with teen puppy love. A few people act like Linda needs to be kept away from tempting boys. She has a greater purpose. As Gwen pokes around, she gets a visit from her old friends from Africa which makes her lose control. But she returns to her school gig because she must know what’s secretly going on in this quiet little town. The Witches brings out the sweet joy of the English countryside like an episode of Great British Bake Off. But the darkness creeps out like a soggy bottom pie during judging. The film couldn’t get too intense since in 1966 movies had to basically be G or PG. This would prove to be Joan Fontaine’s last theatrical release after three years on the big screen including an Oscar win for Alfred Hitchcock’s Suspicion. She handles her breakdowns with the right amount of overwhelming shock as the nightmare explodes in her face. The film does seem to set up the tone that would be allowed to go deeper in the R-rated The Wicker Man (the Christoper Lee original and not the head scratching Nic Cage remake). The Witches really gets the nightmare that can crop up when the locals don’t want you around no matter how sweet they act at first. The video is 1.66:1 anamorphic. The transfer really highlights the African Witch Doctor masks and the gentle nature of the country life. The audio is DTS-HD MA mono. The levels bring out the sounds of the various rituals. The movie is subtitled. Audio Commentary With Filmmaker/Historian Ted Newsom gets deep into the film. He opens up by pointing out the career of one of the minor actors. He knows his Hammer history and gives a lot of background on this minor production for the studio. Turns out Joan Fontaine brought the project to Hammer. Hammer Glamour (44:09) is a review of the actresses that brought sensuality to Hammer’s productions. This TV special from 2013 catches up with the actresses including Caroline Munro, Madeline Smith and Martine Beswick. The actresses talk about their attitudes in making horror in the ’60s and ’70s along with other genres from the studio. This is a must see special for Hammer fans. Trailers and TV Spots (3:33) has the U.S. Trailer where it is called, “The Devil’s Own.” There’s TV spots for when the film was double featured with Prehistoric Women. Still Gallery (4:28) are the promotional pics, lobby cards, posters and newspaper ads. Scream Factory presents The Craft: Collector’s Edition. Directed by Cyril Frankel. Screenplay by: Nigel Kneale. Starring: Joan Fontaine, Kay Walsh, Alec McCowen, Ann Bell & Ingrid Boulting. Rated: Unrated. Running Time: 90 minutes. Released: March 19, 2019.